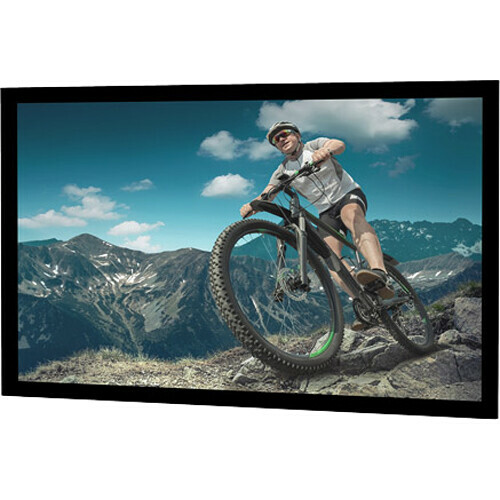 The 78 x 139" Tensioned Cinema Contour HDTV Fixed Frame Projection Screen from Da-Lite is a wall mountable aluminum frame with an HD Progessive 1.1 Perf finish, 1.1 Gain rating and Greenguard certification for use indoors. This finish is designed for use with rear mounted speakers since its built-in perforations allow sound to penetrate with no acoustic loss. The fire retardant, mildew-resistant vinyl finish delivers true color and uniform edge-to-edge image diffusion. The frame is bordered with black Pro-Trim fabric; a smooth, felt-like material similar to the surface of a pool table that helps absorb any excess projection light that might intrude on the picture area. It also provides the screen with a professional finishing touch. The flat frame has 45° mitered slip jointed corners for a precise fit and neat appearance. Tapered edges help reduce any shadows that may spill into the viewing area. The screen attaches to the rear of the frame via reinforced black webbing and snaps that are hidden by the overall design. Wall mounting brackets are included to expedite installation. Box Dimensions (LxWxH) 155.0 x 9.0 x 8.0"
Tensioned Cinema Contour HDTV Fixed Frame Projection Screen (78 x 139", HD Progressive 1.1 Perf) is rated 5.0 out of 5 by 1. Rated 5 out of 5 by Brent from Exceptional quality and an easy install Screen was purchased for use in our new home theatre. We were specifically looking for something that would work very well in low light (not NO light) conditions and that woudl allow us to mount a center channel speaker behind the screen. Given that this screen is 159 from corner to corner, that behind-the-screen mounting was the only way to ensure that character voices really sounded like they were coming from the characters...not from speakers way off to the sides or top. The screen arrived EXCEPTIONALLY well packaged. Box is about 14' long so be prepared. All components were padded with screen surface itself very well protected. Assembly was very easy; just make sure you have a large surface area to use for assembly. In our case, we built it on the carpeted floor just in front of where it was to be placed. I hung the three wallmount brackets quickly and easily securing them with screws into the appropriate studs AND drywall anchors for the off-stud holes. In retrospect, this is probably a bit of overkill as the screen assembly is surprising light even though it is very durable (all precision cut aluminum with strong plastic corner inserts for alignment). The screen was put together in about 15 minutes. I lightly screwed the corners together, did a quick alignment check, and then screwed them down firmly. The screen itself then snaps on to the rear of the screen frame using probably 75 or more snapping points. Just work from a corner outward and it will easily stretch to fill the frame. Hanging it on the wall brackets is easily done with two people. It would be impossible with only one. After hanging, when I first viewed the screen, I was concerned that the holes for the sound permeability would be annoyingly visible while watching a movie as you can definitely see them while the projector is off. I can assure you that they are unnoticeable once you get the movie rolling. 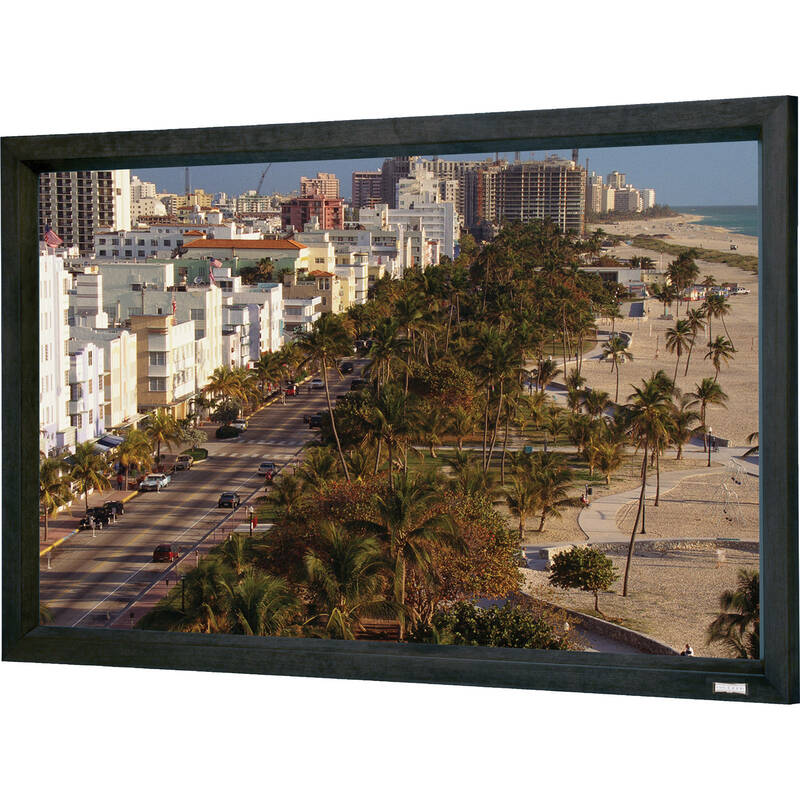 The outer frame is coated with a very light black felt that ensures ZERO reflection. It does a nice job of giving you a clean edge on your video. The projection surface itself looks awesome in my low light settings (low light for us is a room that has ZERO light but then I turn on some gentle accent lights around the edge of the room. It's bright enough with no projector on to navigate the room and find your drink but not bright enough to read by). In this setting, the screen looks incredible. I suspect it would do the same with even low ambiant light. With the entire room lights on, it does wash out a bit; still viewable but not movie like. All of this is with the Epson PowerLite Home Cinema 5030UB running the show. My center channel speaker sits dead center behind the screen. It protrudes about 1/4 from the surface of the wall and this is about as much as you can allow if you don't want any screen deflection. The screen itself is only about 1/4 from the wall surface once you hang it on the wall. As such, be careful if you have anything behind the wall. Overall, the screen is awesome. Easy to put up and looks great. Really gives it a movie theatre feel. In fact, most viewers think it even looks better than the theatre. About the only downside comment I can make is that the screen does emit a strong, plastic and chemical smell for about the first 48 hours after installation. It dissipated after that and we haven't noticed it since.